Karaghuzhlah, Afghanistan—The problem, Abdul Majid will tell you as he leans his stooped, wasted frame against the trunk of a dying apricot tree in his brother’s yard, is not the Taliban. It’s true, the Taliban have been advancing for months through the ancient cob villages of Balkh province. And yes, they did send their scouts at least twice since June to this very village, whose dehydrated orchards reach out of the alkaline plains like some dusty phantasm, and fired rockets once at a checkpoint near the boy’s high school. CEASELESS WAR has made it difficult to study the effects of climate change in Afghanistan. For decades, barely any meteorological data has been recorded; much of the country is too dangerous to carry out continuous research. But studies that rely on empirical observations and data collected in neighboring Central Asian countries and Pakistan show that cyclical droughts have been scorching Afghanistan with increasing frequency since the early 1960s. Spring rainfall, which nourishes most of the country’s cultivated land, has been steadily decreasing by 2.7 millimeters per month. Drought in Afghanistan “is likely to be regarded as the norm by 2030, rather than a temporary or cyclical event,” forecast a 2009 report written by the Stockholm Environment Institute. To put it a different way: In the 1960s and early 1970s, the water that drained from the Hindu Kush’s vertiginous peaks into the turquoise Balkh River in Bamyan and, at the caverns of the Alborz Gorge, streamed into manmade canals that irrigate the loess desert of Balkh province, measured an average of 1,540 million cubic meters per year. By the end of this year, only about 640 million cubic meters of water will have rumbled past the gorge to the bone-dry fields of Bactria—including Abdul Masjid’s. Other people’s fields will get no water at all. They will pulverize into an ocher shroud that hot desert wind will pick up and hang between the land and the sky. Nearly a third of all Afghans, estimates the UN’s World Food Programme, won’t have enough to eat this fall. “Every year it has been dryer and dryer,” says Mohammad Amin, an official at the provincial department of water in Mazar-e-Sharif, the capital of Balkh. “It is not just in Afghanistan—it is happening all over the world. There is less water and no rain.” He looks south out the window. The thirsty crags of the Hindu Kush, less than ten miles away, are lost in dust. Water theft, real and perceived, deepens old wounds in the ethnically volatile northern Afghanistan. Each watershed becomes an ethnic divide. 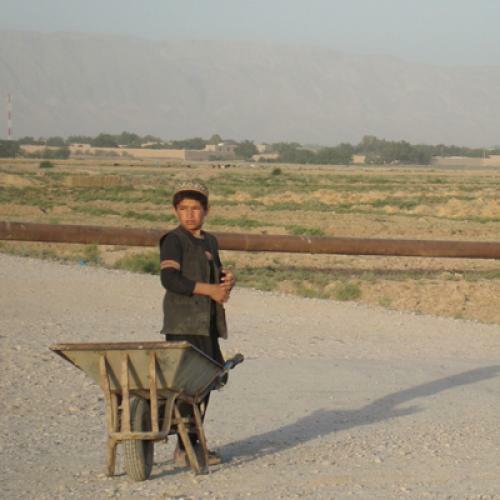 Abdul Majid, a Hazara, says Pashtuns upstream steal the water that should reach Karaghuzhlah. Gulbuddin, the elder of the mainly Pashtun Kampirak, swears it’s the Uzbeks from Nahr-e-Shahi. He talks nostalgically about the Taliban rule, when Kampirak’s irrigation ditches—or so he remembers it—brimmed with water all farming season long. TWO WEEKS AGO, children splashed in muddy dikes of Karaghuzhlah to beat the 120-degree heat. This week, shamal whispered in the dry ditches. Many of Abdul Masjid’s almonds shriveled and dried inside their porous hulls. His wheat harvest, usually abundant enough to sell grain at the bazaar, was so pitiful this year there was not even enough wheat for his family to keep for bread. “Barely enough to sow the fields this winter,” the farmer says. “There is no water.” A familiar refrain, this time in Kampirak, from a widow whose only source of income is whatever grows on her two acres of land. This year, nothing grew. She does not have the heart to evict the sharecroppers, who also will have nothing to eat this winter.